Several times in Lisbon, I have these flashes of "Where am I?" as I see the imitation -- or at least the hints -- of far-flung places, including Paris. That Gustave Eiffel is everywhere, it seems. Here, in the heart of old Lisbon, stands another of Eiffel's towers, certainly less famous but rather more practical than the more iconic one in Paris. It's the Santa Justa Elevator, built in 1902. You might need to wait up to an hour to get on it, then it takes you about half an hour to ride to the top. It's really an open air elevating platform, and not only does it give you a great view when you're on it, it also brings you (slowly, but lazily) from one level of the very hilly city to another. Another great way to get around Lisbon is the trams, much like San Francisco's cable cars, but even more ubiquitous, practical, and efficient. Where the cable cars in SF are mostly for tourists (because of the long waits, much like the Santa Justa Elevator, frankly), even locals use the trams in Lisbon. It definitely makes you want to start singing, "I Left My Heart..."
Some trams are just for the hills. And don't even get me started on the April 25th bridge, which makes this San Franciscan do a double take. It turns out I'm not imagining things: the bridge was built after and modeled on the Golden Gate Bridge, right down to the color (which is not actually official International Orange, the paint color of the Golden Gate Bridge, but it's a close vermillion). If you're ever in Lisbon and wondering "Where am I?" just look up at a tiled building, or down at a tiled sidewalk, and you'll be able to re-orient yourself. Ah, not San Francisco, not Paris. Portugal! By the way, the alternate title for this post was "Eiffel Really Got Around" because I was so impressed to see his name there in Lisbon. Well, apparently, that's nothing. He also designed -- among so many other things in so many other places -- La Casa de Fierro, a large iron house on the big square of Iquitos, a tiny jungle city in Peru; the Konak Pier in Izmir, Turkey; lock gates of the Panama Canal; Maputo's main train station in Mozambique; and several bridges, including the Long Bien Bridge over the Red River in Hanoi, Vietnam; a few bridges in Portugal, and his own reddish bridge, the Barabit Viaduct over the River Truyere, in France's Massif Central, near Cantal. And let's not forget what is arguably his most famous architectural design: the Statue of Liberty. Yes, folks, it's another two-for-one cheese day! First I start with my French cheese, the Tomme de Yenne. It's a hard, raw cows' milk cheese from Yenne, a small village in the department of Savoie, in the region of Auvergne-Rhône-Alpes. When I taste a slice at the store, to see if I want to buy a wedge, I am underwhelmed to say the least. There it is, in the upper left corner of the photo. I can't even hide my apathy toward this cheese, and the cheesemonger tastes it, too, in order to enter in the discussion. He expects it to have a little kick, but he agrees with me: it's quite mild and lacking much character. It's only been aged around one month, which might explain that. I guess it would be fine on a sandwich, or for people who are afraid of cheese. Beiralacte, on the other hand, is a fine Portuguese cheese that I buy at an outdoor market between Sintra and Cascais on the advice of Louij (or however it's spelled in Portuguese, I'm going by sound only), a passionate cheesemonger who gives us what turns out to be the best restaurant recommendation of the trip and also the advice to buy this particular cheese -- in his opinion one of Portugal's very best. I can see why he's in love with it. It's absolutely delicious, with so much farm funk to the flavor. It's on the stinky end of the spectrum, but with a buttery, salty, tang to it that makes it irresistible slathered on a slice of bread (and guess what?! The Portuguese made delicious bread. It's the only place in Europe, other than France, where I really love the loaves). And the texture of the Beiralacte is sublime -- creamy, runny on the edges, and held together by a chewy, robust crust. Beiralacte is a raw, aged goats' milk cheese and, he tells us that what makes it so great is that it's made in the French style. This means that it's partly thickened with rennet, as opposed to many of the Portuguese cheeses which, he tells me, are thickened with nettle plants. Nettle plants! I wonder if I'm losing something in the translation, but I trust Louij so much, I'm not even going to fact check. That, and I'm in a hurry writing this as I must pack and hurry off to Bretagne for a gymnastics competition. I am told that the Beiralacte, my Portuguese cheese for the day, is delicious because it's made in the French style, like a real French cheese. 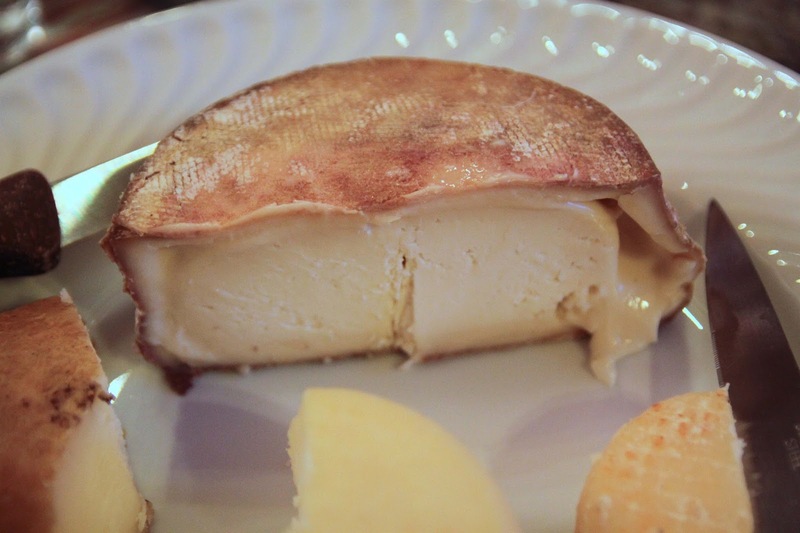 Well, the Tomme de Yenne is a real French cheese, and it's nothing to write home about. So I thought it would be interesting to point out that while I love French cheese in general, they're not all winners. While my initial instinct was to poo-poo Portuguese cheese, I found that the country has an incredibly rich, delicious cheese culture (ha, ha! Cheese culture. Get it?). It's a lesson in remaining open-minded, listening to the advice of great cheesemongers, and the comparison of imitations versus originals. Love this! Are you going to turn this series into a book? You should!